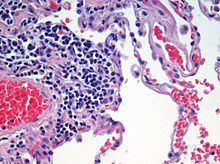 Microscopic view of a histologic specimen of human lung tissue stained with haematoxylin and eosin. Microphotograph of a histological section of human skin prepared for direct immunofluorescence using an anti-IgA antibody. IgA deposits are in the walls of small superficial capillaries (yellow arrows). The pale wavy green area on top is the epidermis, the bottom fibrous area is the dermis. Histology is the study of the microscopic anatomy of cells and tissues of plants and animals, particularly the tissues. It is a part of cytology, and an essential tool of biology and medicine. Histology is usually done by looking at cells and tissues under a light microscope or electron microscope. The tissue has to be specially prepared beforehand. The stages below are only described in outline. Laboratories which do histology work from schedules which are much more detailed. Chemical fixatives are used to preserve tissue from decay. This preserves the structure of the cell and of sub-cellular components such as cell organelles (e.g., nucleus, endoplasmic reticulum, mitochondria). The most common fixative for light microscopy is formalin (4% formaldehyde in saline). After fixing, the block of tissue is embedded in paraffin wax. This holds and preserves the tissue as a block. The section is cut into a series of wafer-thin slices, each of which is put on a glass microscope slide. The machine which cuts the block is a mechanical guillotine which can be set to cut at a suitable depth for the tissue in question. Stains are dyes, chemicals used to make cells and tissues easy to see under a microscope. There are many tissue stains, and each of them has advantages and disadvantages. This is the most widely used stain in biology and medicine. Haematoxylin colours cell nuclei and eosin colours cell cytoplasm. Camillo Golgi developed a silver nitrate stain for nerve cells. 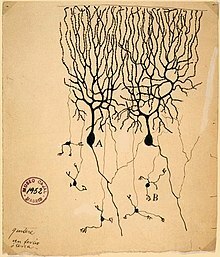 His idea was used by Santiago Ramón y Cajal in his famous work on the structure of brain tissue. Electron microscopy is used often as well as light microscopy. This has its own procedures. Its advantage is that it resolves things which light cannot resolve. For example, viruses were first seen by electron microscopy..
Specialised selective stains using immunology or radioactive labelling are now routine. The advantage of using antibodies or radioactive labels is that they stick to specific kinds of molecules. Increasingly popular is tagging with a fluorescent stain, which shows up even if a tiny part of a cell is stained. Immunoinfluorescence is the name of this particular technique. Wikimedia Commons has media related to Category:Histology. This page was last changed on 9 February 2015, at 12:32.